Ask fellow campers about "Forks 101 RV Park" and nearby attractions. The rate above reflects a monthly rate of $600 a month. The spaces are large in comparison to other parks. I could have stayed connected and still had a nice little green area behind my camper. Plenty of room to put the awning out. It's a nice, deep park, with wild blackberries everywhere for breakfast in the morning. Wifi was spotty and slow, and only available in the first few spaces near the office. The laundry was pretty clean and all the machines worked. Only $1.75 a load! It's super dog-friendly--just pick up your dog's poop! The new owner is super helpful and very no-nonsense. I liked her immediately. She's making some changes, but still needs a few things like fire pits and picnic benches for every site, and sewer caps for every drain. But she's working on it. She's also very responsive. I had an electrical issue when I first plugged in, and she had someone on it that same day. It was fixed by evening. We camped at Forks 101 RV Park in a Travel Trailer. There's a big grocery store and hardware store right across the street, which is super convenient. Propane is at the TruValue store. I don't recommend TruValue for anything else though--terrible service there and 6 dog poop bags for $7. Holy moly. TONS to do around Forks: La Push, beaches, rain forests, hiking, kayaking, the Makah Reservation, etc. Just so much to do. And if you're a twilight fan, you'll really enjoy yourself here. In spite of some negative factors, we have stayed here 4 years in a row. I think it is still the best park to use to be fairly close to the west side of Olympic NP. The $2 charge for Wi-Fi is new and we were able to connect long enough for our minimal (e-mail and web surfing) needs. As usual, we had a fairly tight, back in, FHU site across from the office in the front section of the park. Since most of these sites are satellite friendly, we always stay in these sites because there is no cable TV. Although, there are some sites that are not good for satellite TV, the pull through sites in the back of the park appear satellite friendly. Since the showers were pay showers in the past, we did not bother with them. The park has no recreational amenities and I saw no recycling. We camped at Forks 101 RV Park in a Motorhome. This is a nice RV park right across the street from the grocery store in Forks. We used it as a base for exploring Olympic NP (Hoh, Quinault, beaches) and it was a great location. We were given the option of a spot up front (a little more crowded but decent wifi) or in the back (more space but no wifi). We chose the front area - right across from office, laundry and bathroom. Spaces were a little tight, but not too bad and worth it for us to be able to have wifi. There is definitely more space and grass in the back - the trade off is the wifi doesn't reach that far. Everything was great. We would definitely stay here again. We camped at Forks 101 RV Park in a Travel Trailer. This park was purchased in 2017. The new owner is a very nice person, but has a learning curve on how to run a RV park. Two of her employees left her in May with little warning. We parked in a gravel back-up because it was closer to the WiFi. Leveling was required. Despite our location, the WiFi was very poor (virtually useless). And no cable. The bathrooms could be improved. Having said all this, we would still come back to this park. I believe the new owner will improve things over time. 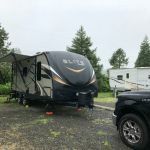 We camped at Forks 101 RV Park in a Fifth Wheel. There is a Thriftway grocery in Forks. Adequate but a bit pricey. If you go to Port Angeles, shop at SuperSaver mkt. Great selection and great prices. There are a number of things to see in the Forks area. Don't miss the Hoh Rain Forest. I thought this park offered the PA rate but they no longer do. Mostly back in sites (did not check the back of the park as there is no WiFi past site 24). No picnic table and no firepit (there's a communal firepit). We decided to stay one night since we needed showers and laundry ($1.75 per wash or dry). Bathroom had two stalls, one out of order. Showers supposedly need quarters but I think the box is broken (bottom is open and lots of quarters there to use if required). The price with tax came to over $38. Too pricy in my opinion when you can get electric and water at Bogachiel for $30. I felt bad for the woman running the place as she just got here a week ago and the owners seem to have taken off (on vacation?). A real trial by fire for her. She did recommend another campground that didn't offer PA but was "prettier" than Forks 101. I wouldn't stay here again unless lots of improvements were made. We camped at Forks 101 RV Park in a Travel Trailer. Grocery store and camping outfitters right across the street. We had supper at Golden Gate. Decent food and prices, good service. We encountered electrical issues at this park (if we had not, I would rate it a 7). Never had any similar issues before in the 4 years we've had our new RV. There was an electrical incident that took out at least $1500 in appliances and two EMS boxes while we were plugged into 50-amp outlet at site 34. The root cause could not be determined as we weren't willing to tear apart our RV walls and the RV park/electrical company weren't going to excavate their power lines or transformer. All I know is everything was good until we sat in the rain/winds for 4 days at this park. After the incident, the power worked normally (30-amp outlet) for the remaining 3 days we were there. We did not ask the park for anything and they did not offer anything to us after the incident. New owners recently bought the park. Owner was very pleasant over the phone when we made reservations and checked in. Our site was in the grassy section of the park. There are large hedges/grouped trees that help to hide the row of mobile homes across from the RV sites. But, because of these hedges, not all of the pull thru sites are "pull thru". 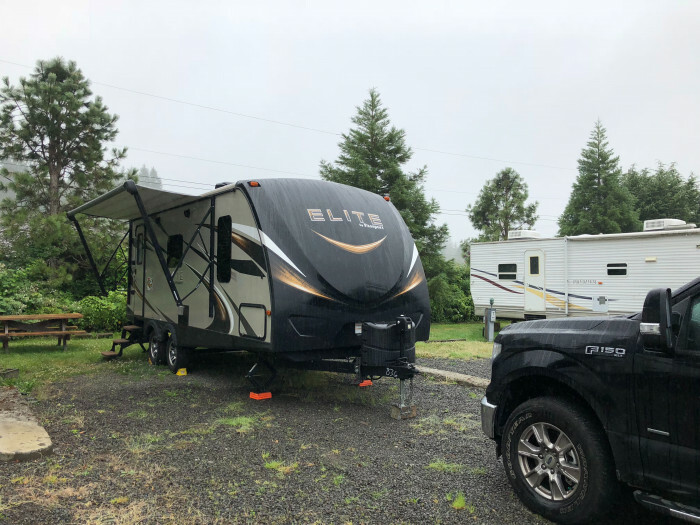 We were able to park our truck and SUV next to each other in front of our 40' fifth wheel, so the site accommodated us well. Even with all the rain, the site wasn't muddy. Picnic table deteriorating/mossy wood; fire pit was cinder blocks put in a circle overgrown with grass/weeds. Water and sewer hookups worked fine. Laundry room up front by the office; three washers, three dryers. Washers were a bit dirty (had pine needles and such in them). The few times I tried using the WiFi, it was too slow to open up websites or check email. AT&T cell signal bounced between 1 bar 4G and 1 bar LTE. Park was mostly quiet; behind the RV sites is a field with a couple horses. Some kind of firing range not far away as heard gun shots often during some afternoons. Good location for visiting Olympic NP and ocean beaches. 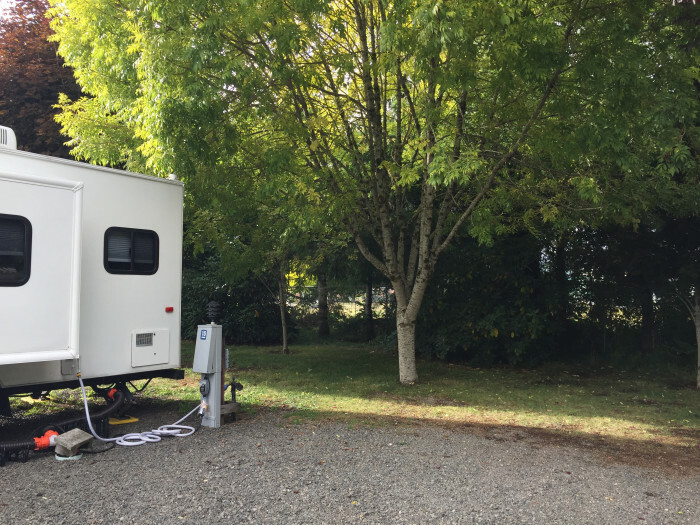 We camped at Forks 101 RV Park in a Fifth Wheel. Sol Duc Valley in Olympic National Park was our favorite area of the park. This park is right in the town of Forks, on Hwy 101. The owner was very friendly and informative. They accept Passport America and during off-season there are no restrictions. We had a nice long pull-thru site that was open and sunny so we decided to stay two nights. We camped at Forks 101 RV Park in a Motorhome. We went to Rialto Beach and LaPush; there is also access to Hoh Rain Forest and Port Angeles is about 60 miles away. Turns out Forks is the town featured in the Twilight Saga books (apparently the author wrote them here) but none of the filming was done here. Lots of grassy sites and lots of space. Park has permanent residents and is a bit older and worn down but that doesn't bother me. We're here to enjoy the surroundings and there was tons to see. Wifi is weak at best so bring a hotspot. Satellite TV worked fine. Pull through sites are large and long. Will come back. We camped at Forks 101 RV Park in a Travel Trailer. Go down to Ruby Beach and Kalalock Beach and watch for whales in between. Visit the large cedar trees and the Twisted tree. Lots to see and explore. We have been here at least half a dozen times over the decades. See my 7/16 review for a more detailed description of the park. As usual, we had a back in, FHU site across from the office that was satellite friendly. I think $40 is a bit much for a park without cable TV (there is none in the area) or any recreational amenities. The bathrooms and laundry are older but clean. The pay showers are a secondary reason I said the value was bad. The Wi-Fi worked fine for our minimal (e-mail and web surfing) needs. Having a full service store across the street is a big plus. For what it is worth, this is probably the best RV park west of Olympic National Park. We camped at Forks 101 RV Park in a Motorhome. Easy to locate: right on "main street." All grass sites (in back section), quite wide, but just barely long enough for 36' MH + toad. Dirt roads easy to maneuver with bigger rig. Good water pressure and 50A electric. Wifi connection is good, but internet is slow. Very friendly staff who allowed me to have some Amazon packages shipped here, and even allowed me to change oil in my generator (even though "rig maintenance" was forbidden per park rules). I would definitely stay here again. We camped at Forks 101 RV Park in a Motorhome. Rialto, Ruby, first and second beaches, Hoh rain forest, Twilight (movie series) sets & building for fans. July 7, 8, $37 for full hookups with discount, $2 a night for pet This campground is right on the main street in Forks right across from a supermarket. The park has 56 sites plus tent sites. The laundry room was great, a short walk from our site with three washers and dryers. Two hot showers in the park for a fee (25 cents for 5 min). Sites are close together. A number of seasonals in this park. Check in was fast and easy. The couple managing the park were very nice. Firewood sold for $5. We stayed here two nights and enjoyed being able to walk into town for haircuts, restaurants, shopping and Twilight Highlights. Good stay! We camped at Forks 101 RV Park in a Motorhome. We walked through the town to see some of the highlights of the Twilight Series written by Stephanie Meyer. The Visitor Center has maps for locating homes, school, restaurants, beaches, where they worked etc. The Rain Forest Arts Center in Town has a new free exhibit that highlights the books, costumes and props from the movies. Sites had grass, normal distance apart, several full-time trailers and RV sites in park. We had full hook-ups which worked well. New owners and manager are in process of updating the campground. Most sites had a picnic table and fire pit, but our table was broken and no fire pit yet. Wifi didn't work in back, so if you need wifi, get site closer to the front as it did work there. Laundry facilities- good price, very available, machines worked! Convenient for driving Hwy. 101 for Olympic NP visit. We camped at Forks 101 RV Park in a Travel Trailer. Staying here for a couple of nights passing thru. As previously stated, Ace and grocery store across the road. We had a site in the back (all grass) and it was about 60 feet long and maybe 20 feet wide. Our site had a ground problem on the 50 amp side so we used the 30 amp plugin. Lady in office offered to move us, but with mild weather, we elected to stay on our site. As previously noted, kids across the gravel street in the mobile homes used the empty sites a couple of sites away to play in and ride their bikes all thru the sites. Mobile homes are in bad shape, so the quality of people there can't be the best. Liked the site we were in and if in the area again, would stay there, if the kids were corralled. We camped at Forks 101 RV Park in a Motorhome. Small park in a great location to see Olympic National Park and other sights in Northwest Washington. Nice grocery store and Ace Hardware right across Hwy. 101 . 15 gravel back-in sites are in the front (near the Hwy) and 15 long grass pull-thru sites in the back of the park along with the dog area. WiFi signal was week and slow but AT%T worked well. Our pull-thru site was over 60ft long and level. Laundry room was clean; washers and driers looked new and worked very well. 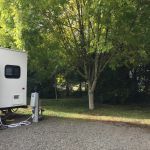 The pull-thru sites face a collection of permanent mobile homes that are not part of the RV Park but use a common road so there is some traffic and noise but was not a problem. There are some older RV's in the park and a few are not well maintained and looked Junky but over all the park was was clean. Lots to se in the area and this is a great location, would stay here again when in area. We camped at Forks 101 RV Park in a Motorhome. The pull through sites are long and far apart. The main paved road is shared by the mobile homes that are across the street. Just my opinion, but I think both were owned by the same person until recently when the RV part was sold off. Since the RV park is not full much of the year, as a result the kids from the across the street are used to using the grassy 'field' as a playground even when it is occupied. A call to the office corrected the problem right away with a call to the manager of the mobile home park. We were in site 50 and sites 52 and 48 are also across from a lot of kids so I would suggest asking for a site closer to the road to avoid having basketballs bouncing into your car or rig or kids riding their bicycles through your yard. There is a sportsman club just one block to the south so there was some gunfire noise during the day but not bothersome to us. The road noise was minimal since we were so far from the road. The back in sites that are gravel nearer the front are closer together and might have a noise problem. We did not disconnect because we pull a trailer. We took our motorcycle out and there are some very good 'rides' in Olympic National Park. We camped at Forks 101 RV Park in a Motorhome. Grocery, hardware and sports store across the street. We would only stay here again if nothing else was found. If you're here on a Wednesday morning, the Visitor's Center and Logging Museum on Hwy 101 offer a complimentary 3 hour logging and mill tour. Our tour guide was a retired forester who moved to Forks in 1979 and has lived and worked here ever since. It's very interesting and informative, so be sure to sign up ahead of time as slots are limited to the number of seats on the van. Grocery and varied shopping actually across the street. Stop at the very friendly visitors center at the south end of town for information on the area. We are staying a week and every day is full. Are you affiliated with Forks 101 RV Park ?